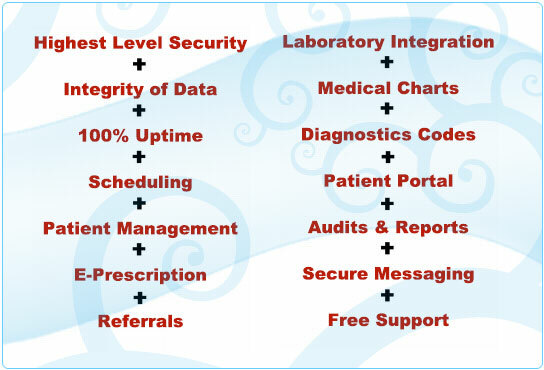 Features are included in the software to maintain integrity of data associated with the patient's medical records. Dedicated support services are provided to meet the needs of small and medium practices. Highly trained support team members are available through Email, Live Chat, & Phone. A user-friendly web-based interface enables ease of day to day activities, increasing the efficiency of practice management. Color-coded scheduling for multiple providers, daily & weekly views with single & flexible online calendar capabilities. Computer-generated prescriptions/refills can be sent electronically to any of the 60,000+ pharmacies, or the pharmacy of your choice. Quickly and Securely order and receive lab tests and results. ICD-9 diagnostic coding system with over 17,000 diagnoses in the database. Standard medical charting templates for each specialty can be customized. Patients can view appointments, diagnoses, medications, immunizations, and/or personal medical records at any time. iPad and other mobile devices can be utilized securely to manage patients, prescribe medicine, and use other features of the software; providing convenience, flexibility, and portability in real time.